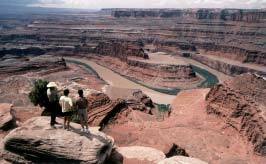 Convention field trips will include classic geologic sites throughout Utah, such as Dead Horse Point. Photo courtesy of Utah Division of Parks and Recreation. Editor’s note: Tom Chidsey, General Chairman for the 2003 AAPG Annual Convention, is Manager of the Utah Geological Survey’s oil and gas section. The Survey is an active AAPG supporter and welcomes the 2003 AAPG Annual Convention to Salt Lake City. The convention slogan and logo, “Energy—Our Monumental Task,” applies to the entire worldwide membership of AAPG. The backdrop depicts the famous Monument Valley, located in Arizona and Utah, which represents the need to balance preservation of the scenic open spaces of the American West with providing energy for a growing world economy. Utah assists with this monumental task of providing energy in an environmentally responsible way while consistently remaining in the top 15 oil- and gas-producing states. Fifty oral sessions and 50 poster sessions will provide approximately 1,000 technical presentations during the three-day conference. The session topics are grouped into nine themes: (1) global energy resources, (2) the business side of petroleum, (3) technologies – new and proven, (4) reservoirs, (5) structure and tectonics, (6) stratigraphy, sedimentology, and paleontology, (7) petroleum systems and geochemistry, (8) environmental issues, and (9) student presentations. Sessions sponsored by AAPG and SEPM will cover a wide range of hot topics including new play concepts from the world’s petroleum provinces, deepwater sequence stratigraphy and deposition, biostratigraphy, reservoir modeling, salt tectonics, lacustrine reservoirs, and emerging gas plays. Each of the AAPG divisions – Energy Minerals Division (EMD), Division of Environmental Geosciences (DEG), and Division of Professional Affairs (DPA) – is sponsoring specific sessions and forums on topics such as coalbed methane, carbon dioxide sequestration, remote sensing, methane hydrates, environmental best practices, and national security as it pertains to petroleum. “The landscape everywhere . . . is of rock – cliffs of rock, tables of rock, plateaus of rock, terraces of rock, crags of rock – ten thousand strangely carved forms; rocks everywhere,” was penned by Major John Wesley Powell on July 17, 1869, to describe what is now part of Canyonlands National Park. The rest of Utah also has rocks everywhere. The 23 field trips being offered at the Salt Lake City meeting will provide ample opportunity to witness spectacular displays of well-exposed geology. The field trips will take participants to the classic Utah geology that serves so well as both modern and ancient outcrop reservoir analogs. These trips fit into the wide range of convention themes where participants can examine ancient and modern lake deposits, thrust and extensional faulting, salt tectonics, fluvial-deltaic sequences, carbonate mounds, eolian facies, dinosaur fossils, the geology of coal and coalbed methane, and sequence stratigraphy. Many of these trips will take place in national parks, monuments, and recreation areas, such as Zion, Arches, Canyonlands, Lake Powell, and the Grand Canyon, that were set aside for their geology and scenic beauty. Note: One does not have to register for the convention to attend a field trip or short course. For more information contact the AAPG Convention Department at 1-800-364-2274.